Like most common names, "Tiny Blue-Winged Olive" can refer to more than one taxon. They're previewed below, along with 3 specimens. For more detail click through to the scientific names. These are pretty much always called Tiny Blue-Winged Olives. The only Acentrella species commonly reported to be important to anglers is Acentrella turbida, though Acentrella insignificans is important in some western locales. See the species pages for distribution and timing details. This genus is one of two (including Heterocloeon) that can easily be distinguished from other Baetidae genera by the presence of a conical mesonotal projection (Conical mesonotal projection: small cone shaped spike sticking up from the top and front part of the middle thorax segment.). A. turbida lacks hindwings which is useful for distinguishing this species from all others in either genera. A. turbida was previously known by the names of its synonyms (Synonym: A former name of a taxon, usually a species. Entomologists frequently discover that two insects originally described as different species are one in the same, and they drop one of the names. The dropped name is said to be a synonym of the remaining name. These changes take a while to trickle into the common knowledge of anglers; for example, Baetis vagans is now a synonym of Baetis tricaudatus.) Pseudocloeon turbidum in the West and Pseudocloeon carolina in the East. 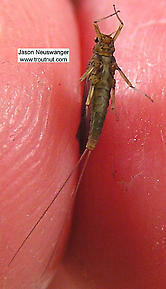 Female Acentrella (Tiny Blue-Winged Olives) Mayfly Dun View 3 PicturesI've lost the date information for this specimen and taken a guess. See Acerpenna pygmaea for details. It is the only species known to be of even minor importance to anglers and was previously known as Baetis pygmaeus. Acerpenna pygmaea (Tiny Blue-Winged Olive) Mayfly Nymph View 3 PicturesThis is a very rare mayfly in western Montana. The shape of the last gill is a key to its identification. I have collected this species in only one location. This genus contains only one species of any known significance, Apobaetis futilis, a Western hatch. 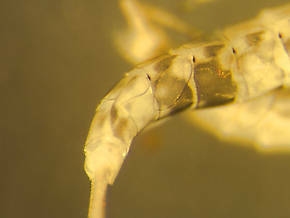 For anglers looking for correlation with older angler entomologies, this hind wingless little mayfly was formerly known as Pseudocloeon futile. Heterocloeon is one of two genera along with Acentrella that can be differentiated from other baetids by the presence of a conical mesonotal projection (Conical mesonotal projection: small cone shaped spike sticking up from the top and front part of the middle thorax segment.). 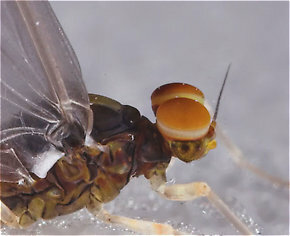 All but one species of this genus can be further separated from Acentrella by the lack of venation (Venation: The pattern in which the veins on the wings of an insect are arranged. It is usually one of the most useful identifying characteristics.) in the tiny hindwings. There is little evidence that the species of Heterocloeon are of much significance to anglers. This genus contains only one species of interest to anglers, Labiobaetis propinquus. See the species hatch page for more information. The costal projection of a Baetidae dun. Costal projection: A bump or point sticking up from the front margin of an insect's wing, usually the rear wing of certain mayflies. It is sometimes called a costal process.) ( a few obscure species have them but they are so reduced as to be barely observable under low magnification) and lacking a conical mesonotal projection (Conical mesonotal projection: small cone shaped spike sticking up from the top and front part of the middle thorax segment.). Their two tailed nymphs are more difficult. Two of the tiny species in this genus may produce fishable hatches: Plauditus dubius in the East and Midwest, and Plauditus punctiventris in the West. The latter is the most prolific and important. Both were previously in the genus Pseudocloeon. This tiny hind-wingless Midwestern and Western species can produce excellent hatches because it is so extremely abundant. It appears in previous angling literature under the former names Pseudocloeon anoka in the Midwest and Pseudocloeon edmundsi for its western synonym (Synonym: A former name of a taxon, usually a species. Entomologists frequently discover that two insects originally described as different species are one in the same, and they drop one of the names. The dropped name is said to be a synonym of the remaining name. These changes take a while to trickle into the common knowledge of anglers; for example, Baetis vagans is now a synonym of Baetis tricaudatus.). Its bright green duns are unmistakable. In the West they can also be an equally unmistakable bright almost fluorescent chartreuse, especially as nymphs. They are very common in the Northwest and Rocky Mountain states, with their population densities giving way to the similarly tiny and hind-wingless (though more somber colored) Acentrella species in Southern Oregon, California and the Southwest. This species may produce good hatches. This hind wingless little mayfly was formerly known as Pseudocloeon futile and can hatch in excellent numbers in certain western locales. Costal projection: A bump or point sticking up from the front margin of an insect's wing, usually the rear wing of certain mayflies. It is sometimes called a costal process.). It was previously classified as Baetis insignificans. This species was previously known as Baetis propinquus, a name from older nomenclatures and angling literature familiar to many western anglers. Prior to its current listing, it did a brief stint in the genus Pseudocloeon. The irony is that though this species has hind wings, it was the last species remaining in Pseudocloeon (before the genus recent Nearctic taxonomic demise) which was best known for its species lacking hind wings as an identifying character. Costal projection: A bump or point sticking up from the front margin of an insect's wing, usually the rear wing of certain mayflies. It is sometimes called a costal process.) on its tiny hind wings. Conversely, the presence of hind wings and lack of conical mesonotal projections (Conical mesonotal projection: small cone shaped spike sticking up from the top and front part of the middle thorax segment.) makes them easy to tell from the more common and equally tiny Acentrella turbida. This species is known in older taxonomies under the former name Baetis pygmaeus. It is a diminutive baetid with distribution across every region. It is reported to have localized hatches of occasional importance. These tiny mayflies were once known by the names Pseudocloeon carolina in the East and Pseudocloeon turbidum in the West. They are now considered synonymous. With the new species name turbida, these mayflies were also moved to the genus Acentrella. The combining of these two species has made turbida's distribution trans-continental. In places their numbers compensate for their small size and make for excellent hatches. This male Baetidae dun has slightly turbinate eyes. Turbinate: Shaped like a top or elevated on a stalk; usually refers to the eyes of some adult male Baetidae mayflies which are wider near the tip than at the base.) eyes (hence its name) and stockier build help to differentiate it. 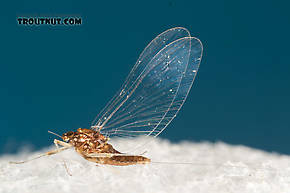 They are often found on the water with a mix of other Baetidae mayflies, making for very challenging fishing. These are often called Tiny Blue-Winged Olives. These are very rarely called Tiny Blue-Winged Olives. This species produces very strong hatches on fertile Western spring creeks. They are extremely small mayflies but may be extremely numerous. Conical mesonotal projection: small cone shaped spike sticking up from the top and front part of the middle thorax segment. 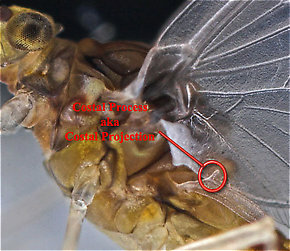 Costal projections: A bump or point sticking up from the front margin of an insect's wing, usually the rear wing of certain mayflies. It is sometimes called a costal process. Longitudinal veins: Longitudinal veins are the major long veins running length-wise through an insect's wing, connecting the base to the outer margin, or the major branches from those veins. Synonyms: A former name of a taxon, usually a species. Entomologists frequently discover that two insects originally described as different species are one in the same, and they drop one of the names. The dropped name is said to be a synonym of the remaining name. These changes take a while to trickle into the common knowledge of anglers; for example, Baetis vagans is now a synonym of Baetis tricaudatus. Turbinate: Shaped like a top or elevated on a stalk; usually refers to the eyes of some adult male Baetidae mayflies which are wider near the tip than at the base.